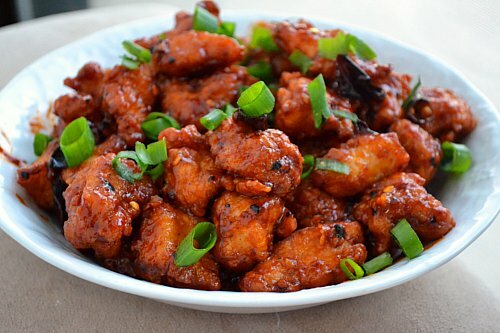 General Tso’s Chicken is an American favorite that combines the perfect blend of sweetness, acidity, and spice, paired with the tenderness of the chicken and the crunch of its flavorful breading. The flavors of this dish are derived from a wide variety of ingredients, and a few special spices. The spices used can vary depending on the preparation of the chicken, but here are some of the most common spices used in General Tso’s Chicken and their spice profile. Garlic is a spice that adds many complex flavors to General Tso’s Chicken. It is often described as aromatic, warm, sweet, and spicy. This makes it an ideal spice for General Tso’s sauce. This spice is derived from the root of a flowering plant from the lily family. Each portion of the root bulb is called a clove. General Tso’s Chicken recipes often call for the garlic to be diced, minced, or powdered. Garlic was natively grown in Asia though it is now grown in many areas of the world. Within the United States, California is the top producer of garlic. It does not pair well with beverages, fruits, or sweet spices, but its popularity in cooking makes it a staple in nearly every type of cuisine world-wide. The complexity of ginger makes it the perfect spice to add to General Tso’s Chicken. It provides some of the dish’s spicy bite, but it also provides a flavor that is warm, sweet, and woody. Ginger is either thinly sliced or used in powdered form in General Tso’s Chicken. It is a root native to Jamaica, China, and India. Some strands may also be grown in the United States or Australia. It is grown underground, and the entire root is harvested and cleaned before being ready for use in beverages, baking, and Chinese Cuisine. Depending on the recipe, powdered Chile pepper may be stirred into the sauce of General Tso’s Chicken, or dried red Chile peppers may be sautéed in the stir-fry, to add an extra spicy kick. There are a number of types of peppers that may be used in General Tso’s Chicken. One of the most common is the Cayenne Chile pepper. You may have noticed cayenne pepper in General Tso’s Chicken you have picked up from the hot deli or local Chinese takeout place. The pepper is long and skinny, and very hot. Cayenne peppers grow from a flowering plant, the Capsicum annuum. They are grown in tropical and subtropical climates, and are particularly popular in India, East Africa, and Mexico. Within the United States, Lousiana is the top producer of cayenne peppers. The Cayenne pepper has a wide range of uses in cuisine, including being used in hot sauces, Chinese, Italian, and Mexican cooking, as well as some desserts and beverages. While sesame seed does not have a notable aroma, it does offer a mild, nutty flavor that is perfect for some General Tso’s Chicken recipes. It also has the benefit of adding a wonderful crunch when it is added to the breading of the chicken before it is fried or seared. Sesame seeds come from the flowering plant Sesamum indicum. They come in yellow, black, white, and red varieties and are native to areas such as Indonesia, Africa, India, and the Middle East. The flowers of the Sesamum indicum have an appearance similar to okra. The seeds are dried before they are harvested, then they must be hulled from their outer shell before being used for everything from Italian bread toppings to Chinese cuisine. Every individual recipe may add unique flavors or vegetables to the mix but these spices provide the backbone to what has become a favorite dish here in the states. If you’ve never tried General Tso’s Chicken before, you really owe it to yourself to visit your local Bento Cafe and find out what all the buzz is about. Lautaro Martinez is a freelance writer and professional student who writes articles and reviews on a variety of topics from the latest tech gadget to restaurants and pubs for your next outing.